So, breakfast today was inspired by a recipe on Oh She Glows, a great healthy food site that fellow foodies out there should really check out. This is her recipe, along with a bunch of other fun toast recipes. This is the way I make the Elvis. In case you were curious, her version is sliced banana drizzled with sunflower seed butter, and topped with chopped dark chocolate. Anyone else drooling yet? 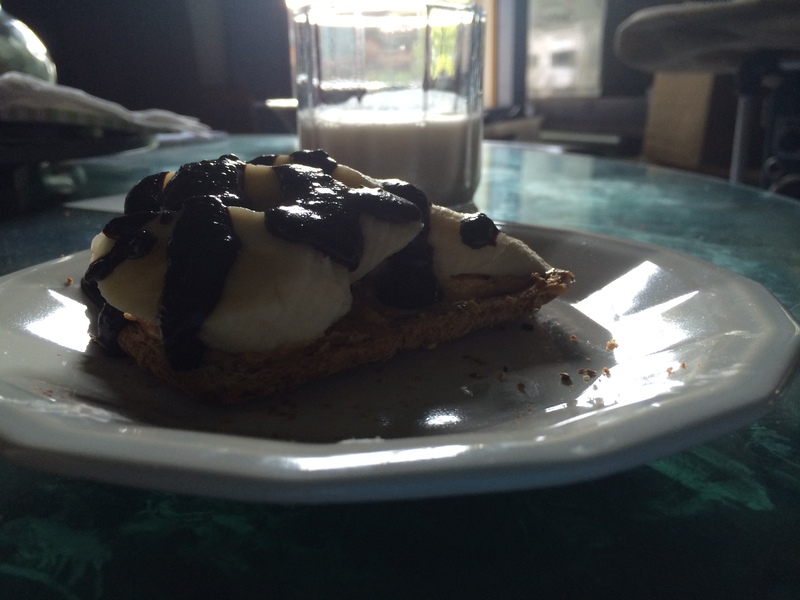 My version is peanut butter, topped with sliced banana, drizzled with homemade dark chocolate. Mmmmmmm…. Oh yeah, It’s healthy too (can it get any better than that?). There’s healthy fat from the coconut oil, protein from the peanut butter, potassium from the banana, and a little bit of iron from the cocoa (got to give it something, right?). First, grab a slice of your favorite bread and pop it in the toaster. Meanwhile, melt a small spoonful of coconut oil in a small bowl or cup in the microwave (if necessary). Add a spoonful of cocoa, and a drop of maple syrup. Stir, then microwave again for AT THE MOST 30 seconds. Check the texture. It should be smooth and not thick or runny. If it’s too runny, add a pinch more cocoa. If it’s too thick, add a drop more maple syrup. Then taste it. I like mine very dark, so I did not use a lot of maple syrup at all, but if you like yours sweeter feel free to add more. Then grab your banana, and peel and slice it on a bias, which really just means on an angle. Now put it all together! 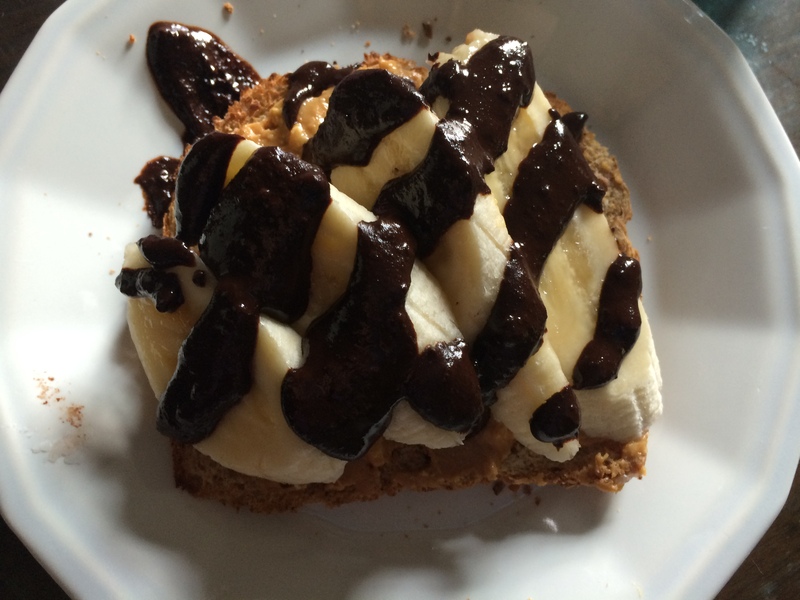 Spread as much peanut butter as you want on the toast, top with banana, and drizzle with the chocolate in some pretty swirls or something (;. I had mine with a glass of almond milk I made yesterday. You can have it with any kind of milk you want, but make sure you have milk with it. It’s one of those things where it’s completely necessary. Oh, and remember, there’s no law against licking the chocolate off the plate. Very good Bethany, I am impressedâ¦canât wait to try it on my grandkids..
Legal Assistant to James H. Ashenfelter, Esq. ← Garden Photography + Book of the Year 2014 + Happy Birthday!! !